The center of life for most of the citizens living in and around Moreauville along Bayou des Glaises has been Sacred Heart Catholic Church whose origins date to 1858. Prior to that time people of the Moreauville area attended Mass and received the sacraments at Our Lady of Mount Carmel Church, established in 1796 at Hydropolis on lands adjoining the present day St. Paul’s Catholic Church Cemetery. The committee to organize the Moreauville Church was headed by William L. Voorhies, President of the Association, and they worked from 1857 to achieve their goal. On April 9, 1858, Mrs. Aimee Joffrion Boyer, donated to the Church a plat of land that was part of the present site for the new Church and Cemetery. Plans were made, the contract let, and work began on the Church that would be dedicated to St. Hyacinthe. This church was a part of the Mansura Church District. The first Mass was celebrated in late 1858. It was later blessed by Bishop Auguste Morre Martin. Rev. Thomas Rebours was the first pastor. In 1860 St. Hyacinthe’s was made an independent parish – the second oldest in Avoyelles. The Civil War was devastating to the Moreauville area and poverty was supreme during reconstruction times. Father Rebours School for boys existed from 1870-1876 that he directed until he died. The first Church was large in size as evidence by old photographs. In 1878 plans were made to replace the Church building as it was showing its age and had perhaps been damaged. The second Church was begun in 1879 and completed in 1882 under the direction of Father Paul E. Simon. The Church’s name was changed to Sacred Heart Church in 1882. In 1891 “The Boy’s College” was begun and continued for several years under the direction of Professor Henry Gorden Lewis. Beautiful Gothic altars were installed in 1888. On Easter Sunday 1897 the fifteen year old church burned. Rev. Constantine Brahic began his pastorate in 1898 and built the third Church that was completed by 1907. In 1900, Father Brahic petitioned the Daughters of the Cross to establish a parochial school – known as St. Frances de Sales that existed from 1900-1920. On Christmas Day 1908, tragedy struck burning the Church, Rectory, School, and Convent. In 1909 a decision was made to build the fourth Church of brick under direction of the new pastor, Rev. Regis Gimbert. Theodore Brune was the architect. Plans called for twin towers in the façade. The basic shell of the Church that was in use by 1910, existed in looks until 1930. In 1914 Father Michael Nothofer had Sacred Heart Parish incorporated. In 1916 Bishop Van de Ven came across a French priest who was expelled from Mexico during the religious persecution. Rev. Henri Jacquemin, tenth pastor, was appointed. A graduate of the Sorbonne University he was well educated having degrees in philosophy, theology, law and music. His special talent was that of artisan craftsman. He was to complete the interior of the Church with beautiful crafted altars that were considered by many to be works of art. He completed the façade of the Church building in the early 1930’s. Bishop Daniel Desmonl dedicated the brick church in 1934. Rev. Stanley Dekeuver, eleventh pastor, established Our Lady of Sorrows Church in 1946. In 1948 he directed the building of the present Sacred Heart Elementary School that was staffed by the Daughters of the Cross and later by the order of Our Lady of Sorrows who continue to serve. In 1959, Rev. John M. Timmermans began a long pastorate that would last for 34 years. During this time the Church was completely renovated in 1960. A new double high marble altar replaced the old altar to face the parishioners. A Centennial Celebration was held in 1961. In the 1960’s the present brick rectory was constructed. Msgr. Timmermans also helped to establish a retirement village, St. John’s, a funeral home was built on Church property, three mausoleums constructed, and he began weekly radio broadcasts of the Mass over local station KLIL that continues to the present day. During Rev. Joseph Montalbano’s pastorate, 1993-1999, the Mays Lacour Parish Hall was established and the Church had a big 135th Anniversary Celebration. Rev. George Krosfield, 16th Pastor, has been at Sacred Heart Church Parish since 1999. Under his leadership the Church was completely renovated in 2003 and plans were completed to establish Sacred Heart Cemetery #2. The renovated Church was blessed by Bishop Sam Jacobs. After almost 150 years, Sacred Heart Church remains an important part of the Moreavuille community. It is the oldest institution of any type in the Bayou des Glaises area. 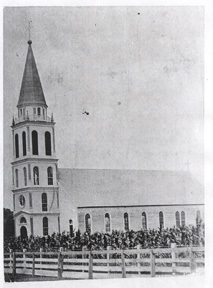 The origins of the present day Sacred Heart Church in Moreauville date to 1857 when Catholic citizens of this Bayou des Glaises area petitioned Father Julius Janeau, pastor of St. Paul’s Church in Mansura, to erect a new church. Prior to that time, the people of the Moreauville area attended Holy Mass and received the sacraments at the forerunner to St. Paul’s, Our Lady of Mt. Carmel Church, established in 1798 at Hydropolis that adjoined the present St. Paul’s Catholic Cemetery. (The Mansura Church was named St. Paul’s in 1845 and also served the Catholics of Moreauville.) An occasional priest would sometimes bring the sacraments to Bayou des Glaises visiting households on horseback. The committee to organize the Moreauville Church was headed by William L. Voorhies as president of the association and they worked from 1857 to realize their goal. On April 9, 1858, Mrs. Aimee Joffrion Boyer, widow of Jean Hyacinthe Boyer, donated to the church a plot of land along Bayou des Glaises as the site of the first church. Plans were drawn, the contract was let and work began. The tall imposing edifice was substantially completed by September of 1858. In January, 1858, Father Thomas Auguste Rebours was sent to assist Father Janeau at St. Pauls. He was from the Brittany area of France, City of Beauvais, and associated with the Diocese of Brieuc. He came to Louisiana in 1855 as a deacon having been recruited by Bishop August Martin of Natchitoches. Rather Rebours was ordained a priest on Feb. 16, 1856 along with his classmate who came with him from France, Father Francois Martin, a brother to Bishop Martin, at the Immaculate Conception Cathedral in Natchitoches. He first served as assistant at the Cathedral, then at Holy Apostle Church on Bayou Pierre at Carmel in DeSoto Parish. Father Rebours took over the Mission Chapel upon completion, teaching catechism, and caring for the needs of the parish. In January, 1859, Bishop Martin wrote to Charles L. Gauthier of Moreauville, a member of the church association, explaining why he had not given St. Hyacinthe’s a pastor or erected it an independent parish. The bishop wrote that “legal title must be given to the Bishop” and this was addressed. On May 23, 1859, Bishop Martin accompanied by several priests came to Moreauville and solemnly blessed the new church and dedicated it under the invocation of St. Hyacinthe. After the celebration and solemn Mass, the Sacrament of Confirmation was administered to five people. The bishop noted the events of the day in the parish registers. On Feb. 2, 1860, Bishop Martin erected St. Hyacinthe’s as an independent parish and named Father Rebours as pastor. St. Hyacinthe’s was the 10th church parish established in the Diocese of Natchitoches. The sacramental records of 1858 -1860 were kept as part of the records at St. Paul.